Remember the last time you moved, scouting out the liquor store and the back alley of every grocery market in town looking for boxes and taping them together? Was that fun? These cardboard boxes can be gross, and sometimes have bugs in them. Some are so compromised that as soon as you pack them, they give away, busting at the seams, dumping your possessions on the curb. Most of these boxes are oddly shaped as well, don’t have tops, aren’t water-proof or crush-proof, and require you or the mover to pack and load your belongings with greater care. Our boxes are made from 100% durable recycled plastic, so go ahead and pack it full to the lid. Your belongings will not break or crush in our EcoPax boxes. Let’s face it, moving is stressful. Adding this extra work of finding the boxes, then taping them and putting them together just makes it worse. 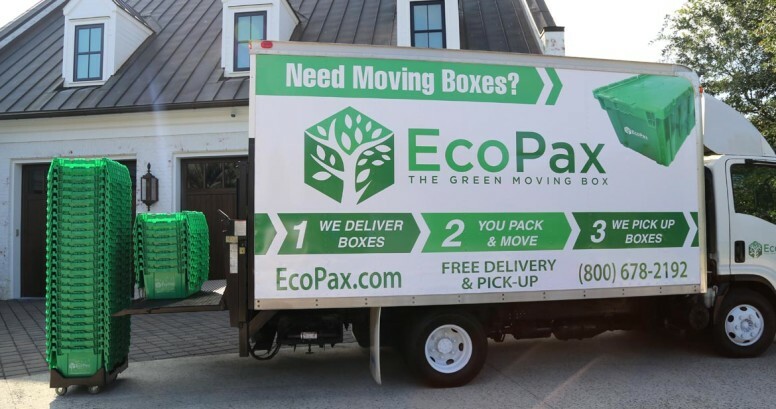 EcoPax simplifies the moving experience by conveniently delivering our recycled, sustainable crush-proof green boxes. These boxes are made from 100% recycled materials and are designed to maximize storage and greatly minimize packing time. They are crush-proof, water-proof, stack-able, and roll with our dollies, which all make moving a breeze. The EcoPax team has over 15 years of customer service and logistics experience, which means you are assured a timely and hassle-free delivery. EcoPax can be used well over 1000 times before we need to replace them, so each individual box keeps over 1000 cardboard boxes from being used over its lifetime. Each box saves over 10 trees from being cut. At the end of each box’s life, we recycle it and make another one. Recycling 1 ton of cardboard saves over 9 cubic yards in a landfill, 6.6 Million BTU’s of energy (390 kWh), and 1.1 barrels (49 gallons) of oil. Each year more than 6 million tons of cardboard waste ends up in landfills. By using EcoPax you can cut this number down dramatically. Unlike Landfills (which simply stock pile trash), recycling removes waste completely, then turns it back into useful products, like EcoPax. After our EcoPax boxes reach their full life (1000 or more uses) we also recycle them, melting them and molding them to make a brand new shiny EcoPax box. Recycling saves money and drastically reduces the amount of trash going to the landfills. A portion of proceeds goes to supporting these parks.